A fine pack-in, but a less compelling standalone. The longer you stare at Acer’s Predator Aethon 500, the weirder it seems. It’s not that it’s an ugly keyboard per se, but you might call it “challenging.” Where most companies might settle on one or two flashy design elements to stand out, the Aethon 500 is all flash, a mess of design elements that often contradict each other. Acer’s definitely making a statement as it enters the mechanical keyboard market, but I’m not quite sure what statement. The Aethon 500 is a battle station. Let’s start there, with its heft. This is a monster of a keyboard, so heavy I actually handed the box off to my colleague Adam Patrick Murray to see his look of surprise. You might think 3.9 pounds doesn’t sound like much, but it’s almost a full pound heavier than other flagship keyboards like Razer’s BlackWidow. It’s large, yes, with thick bezels and a row of macro keys—but more to the point, it’s dense. There’s a lot of plastic here, but also a thick metal backplate and sides. If you need a keyboard to potentially bludgeon zombies with, the Aethon 500’s set to be your best friend. It’s an interesting contrast to the lightweight Futura typeface emblazoned on (most) keycaps. And if those two elements, sans-serif typeface and a thick slab of keyboard, were sufficient to describe the Aethon 500 then I might say Acer had a winner of a design. There are so many odd choices though. For one, you’ll notice I said Futura’s used for most of the keyboard. Weird, right? Don’t ask me why, but Acer’s chosen to use a completely different, more aggressive typeface on the five macro keys. It’s not a terrible juxtaposition, but it’s not endearing either. Aesthetics are subjective of course, but in the case of the Aethon 500 there doesn’t seem to be a unified aesthetic. The logo and the macro keys scream “gaming keyboard” while the rest of it says “office-ready workstation.” Combining the two isn’t doing the Aethon 500 many favors. One of the first elements you’ll notice is the volume wheel. Why? Because it sticks out of the side of the keyboard. Like so much of the Aethon 500, I’m torn on this choice. It’s useful—if the wheel didn’t stick out the side, you’d be left with one that’s about a half-inch long and hard to find. Like Razer’s recent circular media keys, the Aethon 500 makes it easy to run a hand up the side of the keyboard, find the knob, and twist. On the other hand, it’s ugly. It reminds me of somebody hand-writing a sign and making the first few letters enormous, then thinking “Oh crap, I’m running out of space” and cramming the second half in. Unique? Sure, but not in a way I’d love to see others copy. The wheel’s also flimsier than it looks, flexing up and down with even a gentle press. And these are just the Aethon 500’s most obvious quirks. There are more. 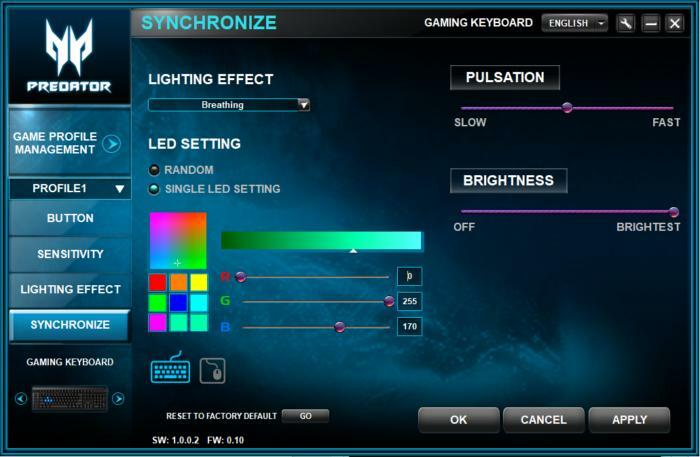 For instance, Acer uses the arrow keys for backlight brightness, plus...a second set of volume controls. Why? You’ll find the same sort of redundancy is also present in Caps Lock/Scroll Lock/Num Lock, where Acer has included a standard row of indicator lights across the top-right edge and made it so the lock keys only light up if active. Again, why? The WASD keycaps are bright blue, and there are no alternate caps packed in the box. You’re stuck with it, which is an odd and limiting choice. The Windows key is also swapped with the Function key, which might not affect you but has definitely annoyed me. I usually open programs by hitting the Windows key and typing the first few letters, and muscle memory means I keep hitting the Function key here instead. Perhaps most baffling of all: The “5” key has two secondary function labels, one for the standard “%” sign and the other for the Euro symbol (“€”). That’s the only EurKEY symbol to show up on the Aethon 500 though, and the accompanying “Alt Gr” key you’d use to access it doesn’t (to my knowledge) even work by default in the USA. It just defaults to a second Alt key. Point being, Acer made a lot of strange choices with the Aethon 500’s design. None of them are really make-or-break, and I haven’t hated having it on my desk these past few weeks. That said, there are better keyboards out there—especially for $180. That might be standard list price for an RGB keyboard, and indeed the Aethon 500’s backlighting is decent enough to compete with Corsair, Razer, Logitech, et cetera. But the rest of the design? I’m not so sure. That $180 price is doubly hard to swallow when you factor in Acer’s switch choice. Did you know once upon a time Acer manufactured its own mechanical switches? Well, mechanical-adjacent maybe—they were modified ALPS switches, with a membrane core. Anyway, those days are long in the past. Rather than revive its old switch, Acer’s instead opted for a fairly standard Kailh Blue on the Aethon 500. There’s nothing wrong with a Kailh Blue in theory. It’s one of the better Cherry MX knock-offs, with a slightly lower actuation force—so slight it’s doubtful you’ll notice, really. Kailh switches also have a reputation for poor quality control though, deserved or not. Regardless of whether you buy into that argument, it means Kailh switches generally don’t command the same price as actual Cherry switches—except here, on the Aethon 500. Kailhs are a common third-party switch though, and thus we can make direct comparisons to other keyboards on the market. You can find other Kailh-equipped RGB keyboards for as low as $60 on Amazon. Now, Acer’s put a lot of work into the Aethon 500 and I’ve no doubt the general build quality is better than most of those $60 keyboards. That said, the Aethon 500 probably deserves a price in between the two extremes—say, $120. Anything higher than that feels a bit steep. Before we wrap up, let’s briefly touch on the awkwardly named “Predator Gaming Device Integration” software. It’s okay. These sorts of software utilities are always hit-or-miss, but Acer’s is at least fairly intuitive when it comes to changing out lighting effects, the one feature most people will touch. Macro customization is more awkward, but can be deciphered by someone who cares enough. My only real complaint is that it’s in desperate need of a graphic design pass. Predator Gaming Device Integration (seriously, what a name) looks like it’s rocking a WinAmp skin from circa 2003. The Acer Predator Aethon 500 isn’t a bad keyboard, and if you’re buying an Acer Predator PC there’s no reason to throw it out. We’ve come a long way from the old rubber-dome pack-ins that came with a lot of prebuilt machines. But Acer’s now selling the Aethon 500 to the public and that’s a more questionable pursuit, especially at full price. It’s one of the few keyboards to include macro keys these days, which might be enough to convince certain gamers, but substandard switches, an eye-watering price, and a cadre of awkward design choices make the Aethon 500 an also-ran in my eyes. This story, "Acer Predator Aethon 500 review: Seriously, who designed this keyboard?" was originally published by PCWorld. Acer's Predator Aethon 500 isn't a bad value-add for pre-built PCs, but its $180 price tag is steep for a Kailh Blue-equipped keyboard with some very strange design choices.